Situated in the heart of the Menomonee Valley, the Falk Corporation has been a fixture of Milwaukee’s industrial landscape for over 120 years. Family-owned until the late 1960s, the company developed a reputation as both “a good name in industry” and a good place to work. Focusing on the production of gears, Falk helped modernize industrial manufacturing, serving a wide array of industries, and thus allowing the company to weather most economic downturns. Herman Falk, son of the famous Milwaukee brewer Franz Falk, first started his machine shop in 1893, eventually renting out one of his father’s old brewery buildings from its new owner, Captain Frederick Pabst. For a short time, Herman and his partner Frank Buff produced couplings for wagons. In the early years, Falk also produced stage equipment for the Pabst Theater and shod horses. 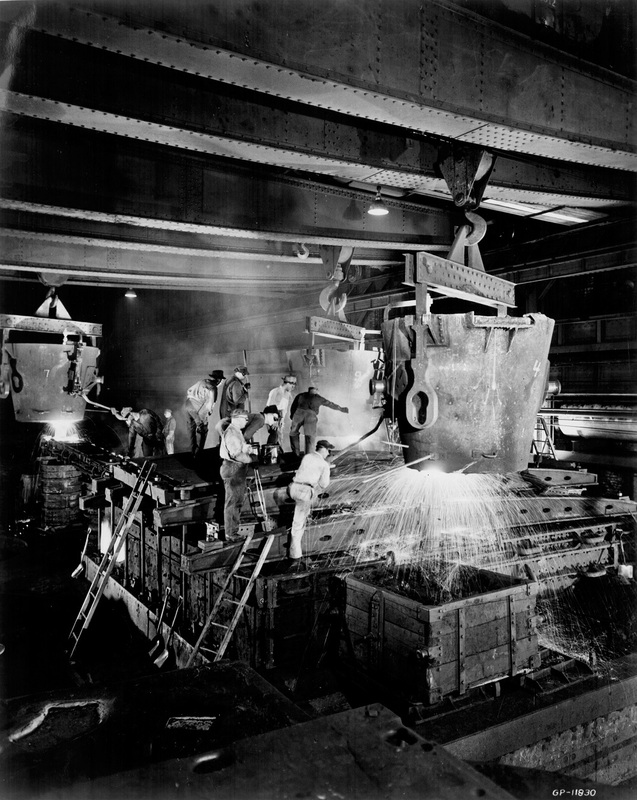 Soon thereafter, Falk developed a process known as “cast welding,” which he applied to electric rail transport. This new technology helped reinforce joint connections between rails, which wore down quickly as a result of heavy traffic. Constantly searching for new inspiration, the founder experimented with other innovations, including kerosene engines and the use of oxidation to cut through steel. Falk settled into its own, however, when it began focusing on gear manufacturing in the early 1900s. As more and more companies introduced electric motors to their production processes, the belting systems used in older equipment were increasingly unsafe. Gears posed much less risk, and thus became an essential component for driving the new machinery being employed in a wide range of industries. Falk found its niche creating gears of all sizes—everything from conveyor belts and elevators to the gates of the Panama Canal, naval propellers of World War II battleships, and even moon rocket transporters and nuclear reactor cases. From the very beginning, Falk was a family affair. It remained that way until the late 1960s, when the family lost its controlling interest, and the firm was sold to Sundstrand. This family-oriented approach trickled down to the company’s workers as well. Although the Falks were never receptive to unionization, they were well-known for offering extensive benefits to their employees—including recreational opportunities, health care, job training, financial aid, home mortgage loans, and college scholarships for employees’ children. Such programs fostered great loyalty and remained common practice until the economic recession of the 1980s. ^ John Gurda, The Making of “A Good Name in Industry” (Milwaukee: The Falk Corporation, 1991). The title here alludes to the slogan Falk employed in their advertising campaigns. ^ Gurda, The Making of “A Good Name in Industry,” 19-23. Gurda explains how the Falk brother sold their father’s brewery to Colonel Pabst following a second major fire at the facility in October of 1892. While three of his brothers went to work for Pabst, Herman invested his share of the money in a new startup—the Milwaukee Thill Coupling Company. Gurda, The Making of “A Good Name in Industry,” 19-23. ^ See Joseph L. Hazelton, “A Winding Path into the Gear Industry: The Falk Corp.,” Gear Technology, July/August 2004, 9-10, last accessed July 18, 2017. ^ “Images of a Milwaukee Manufacturing Powerhouse,” Wisconsin Historical Society website, accessed January 18, 2016. See also, Gurda, The Making of “A Good Name in Industry.” With this new technology, Falk’s company began making all kinds of joints used in railroads, including X-shaped “frogs,” switches, and crossings. It was around this time—May 23, 1895—that the company was renamed Falk Manufacturing Company. Its name was once again changed in 1899 to Falk Company. (Gurda, The Making of “A Good Name in Industry,” 27-33). ^ Gurda, The Making of “A Good Name in Industry,” 42-45. He notes how the Herman Falk was constantly looking for new inspiration to expand business, thus forming the partnership with Henry Harnischfeger (of Pawling-Harnsichfeger) to form American Oxhydric Company and a brief partnership with the Rumely Company in La Porte, Indiana, to produce the Rumely-Falk (kerosene) engine. ^ Gurda, The Making of “A Good Name in Industry,” 45. Gurda discusses how gears had been one of many specialties of the company at the turn of the century but did not become the main focus of their operations until the early 1910s, after Falk purchased the Swiss patent for a new herringbone gear—the Wüst-Kunz gear system. Gurda, The Making of “A Good Name in Industry,” 50. ^ “Images of a Milwaukee Manufacturing Powerhouse.” See also, Hazelton, “A Winding Path into the Gear Industry,” 10. ^ Gurda, The Making of “A Good Name in Industry,” 54-55; 74; 90-93; and 137. As Gurda explains in great detail, Falk first began producing specialized gears for heavy industries like Carnegie Steel and Firestone. Its gears helped operate the gates of the Panama Canal and were used for driving both naval and commercial vessels. In later years, the company complemented its specialized orders with a standardized line of gears that could be used to operate equipment in all kinds of factories: lumber and cement mills, grain elevators, power plants, etc. In the 1960s, as the nation invested in space exploration, Gurda notes that Falk produced gears for nuclear reactor cases, missile silo elevators, moon rocket transporters and other such devices. See also, “Falk Concern Business on Upward Path,” Milwaukee Sentinel, May 24, 1933, 20. Here the author suggests that the Falk Company primarily supplied gears for equipment in the brewing, paper, and oil industries. He also notes that, during the Great Depression, Falk produced speed reducers for equipment that was being used to construct the Hoover Dam as well. ^ Gurda, The Making of “A Good Name in Industry,” 124-129. It was not uncommon for multiple generations of a single family to be employed at Falk. ^ Gurda, The Making of “A Good Name in Industry,” 166-167. ^ Gurda, The Making of “A Good Name in Industry,” 164-177. ^ Gurda, The Making of “A Good Name in Industry,” 178-184. ^ “Rexnord to Buy Falk Corp. for $295 Million,” Milwaukee Business Journal, April 5, 2005, accessed January 19, 2016. Rex Chainbelt had long desired a merger with Falk—as far back as the 1960s, according to John Gurda—but the company ultimately decided to accept the Sundstrand offer (Gurda, The Making of “A Good Name in Industry,” 147-148). Several decades after Chainbelt’s merger with Nordberg (to form Rexnord), this new company finally closed the deal, bringing Falk into the fold and expanding the consolidated company’s reach to new markets. ^ Gurda, The Making of “A Good Name in Industry,” 2. Gurda, John. The Making of “A Good Name in Industry.” Milwaukee: The Falk Corporation, 1991.